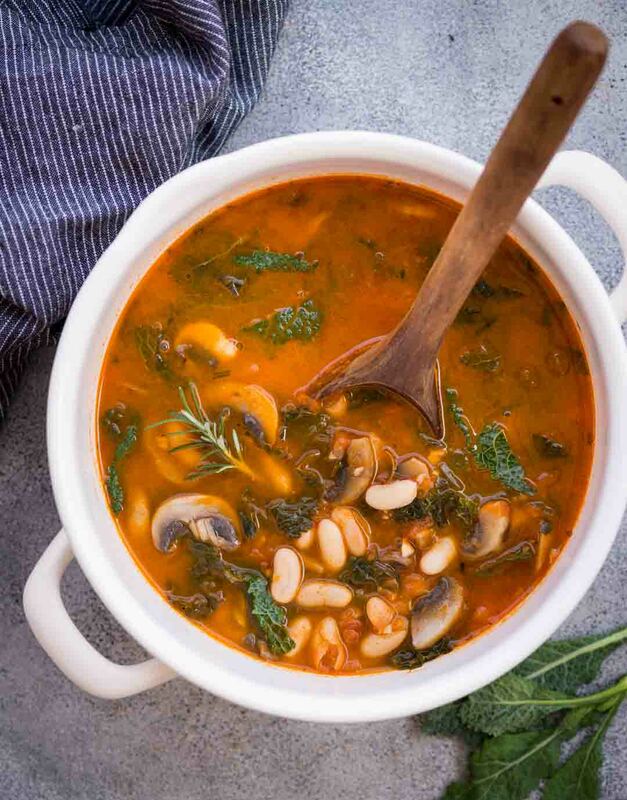 This White Bean Soup with Mushroom and Kale in Tomato based broth is so hearty and delicious. You need only one pot and 20 minutes to make this Soup. Also vegan and gluten-free. A delicious vegetarian soup this time. 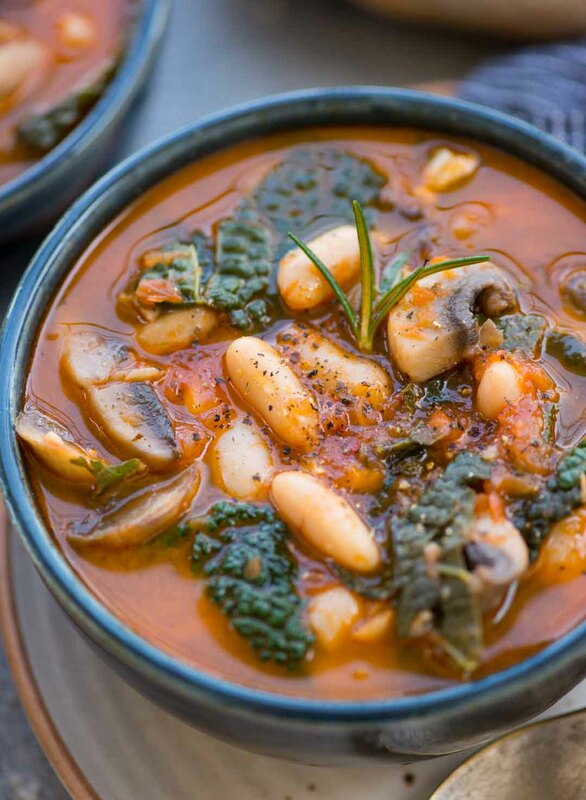 Mushrooms, Kale and white bean, in a tangy Tomato based broth. I have used rosemary because it goes well with tomato. 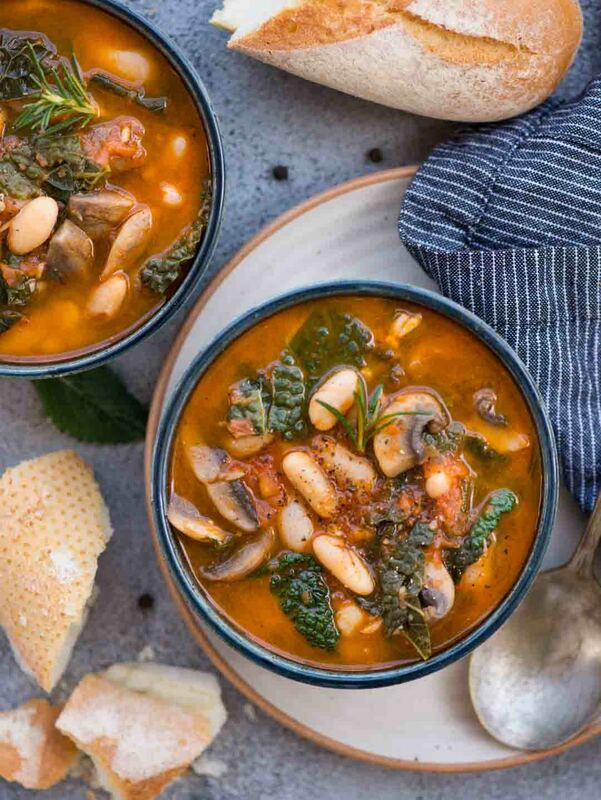 With simple flavours, this soup is also vegan and gluten-free. Basically, this soup is a winner and will keep you warm on cold winter days. I swear this is going to be my last soup recipe for this season. I Know, I have been spamming the blog with soup recipes one after another. But I absolutely love soup and when a try a new recipe and it come out good, then feel I should share with you lovely people. The base of the soup is the tangy Tomato Broth, flavoured with onion, garlic and rosemary. A good quality stock makes a difference here because we are using fewer aromatics. The best part here is meaty White beans. I have used cannellini beans, but you can use any other variant as well. 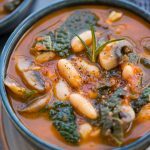 These buttery melt in mouth beans not only gives the texture, but it also helps to thicken the soup. Just smash a few beans towards to thicken the soup. Now coming to the addons I kept it minimal by adding mushrooms and kale. But you can also add carrots, zucchini, peppers etc. 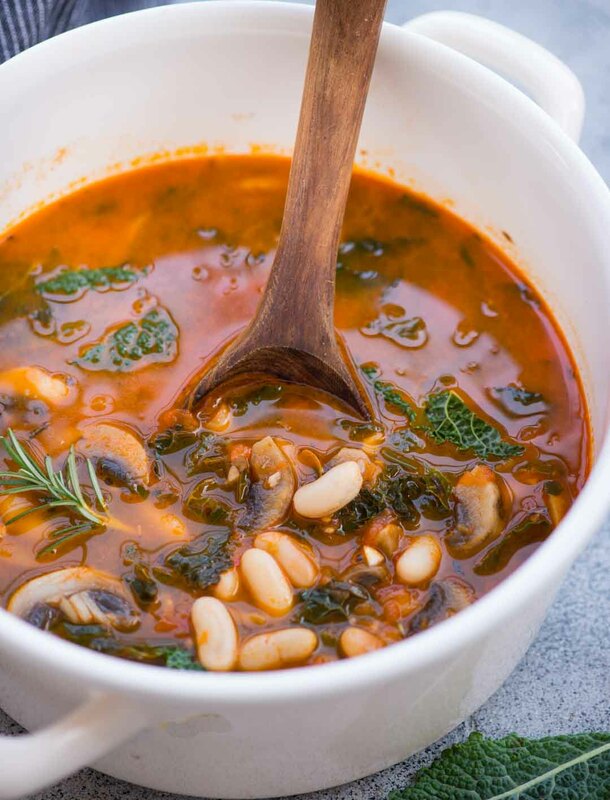 This soup is great as leftovers because you can easily store this for 3-4 days in the refrigerator. Serve this soup with a big chunk of crusty bread. In a heavy bottom pan heat oil. Once hot add chopped Onions. Cook for 2 minutes until soft and translucent. Add minced garlic and rosemary. Fry for 30 seconds. Add sliced Mushroom. Cook mushroom for 5-6 minutes until it starts to brown. Add crushed tomatoes, Stock. Add salt, chilli flakes and pepper. Check the seasoning. Add drained Cannellini beans to the pan. Bring everything to a boil. Add Kale leaves to the pan. Then lower the heat and cook it covered for 5 minutes more. Avoid stirring too much. else the beans would break. If you would like to make the soup little thick, then press a few beans with the back of the spoon at the end. Serve hot with a big chunk of crusty bread.